This adapter allows to connect AC and DC chargers, a USB cable and external antennas to the Iridium Extreme satellite phone. 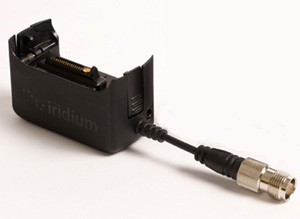 This adapter is supplied as a part of the Iridium Extreme standard kit. Replacement or extra units can be ordered here. IMPORTANT! Note that the Antenna/Power/USB adapter should only be used if you are planning to connect an external antenna to your Extreme Phone. When this adapter is connected, use of your phone’s built-in antenna will temporarily be suspended.